Kamau Leverock and his Clifton Cricket Club teammates won their Derbyshire County Cricket League - Division 1 match against Marehay Cricket Club by 64 runs. Batting first Clifton Cricket Club were bowled out for 194, Leverock opened the inning and was out for 9 after 23 balls hitting 1 six. Anthony Botha was the teams top scorer batting at number 8 with a knock of 47, Robert Peat was the pick of the Marehay bowlers when he returned figures of 15-3-37-6 and Lewis Paynter bowled 7.5-0-36-4. 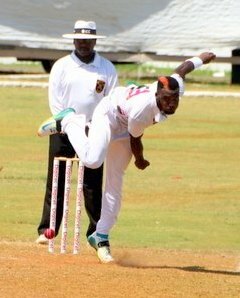 In reply Marehay were bowled out for 130, David Buckley was their top scorer with 43, Botha was also the pick of the Clifton bowlers with figures of 14.3-3-24-6, Leverock bowled 1-0-5-0 and he held onto two catches.